Mohs surgery is a special technique employed by dermatologic surgeons to remove skin cancer with high rates of cure and maximum tissue sparing. This combination is a good fit for the sensitive area of the face. Dr. Yoo is frequently asked to repair the defects that result from this skin cancer removal. Reconstruction ranges from simple closure to much more complex tissue transfer and grafting depending on the size and location of the defect. Left temple squamous cell carcinoma. This cancer was removed by a Mohs surgeon. The size of the defect is shown with the purple circle. The photo on the right shows what he looks like 3 months after reconstruction by Dr. Yoo. This gentleman had a basal cell carcinoma removed from the right side of his nose. The photo on top shows the defect after cancer removal. The reconstruction was performed with a bilobed flap. Mohs reconstruction of left nostril. 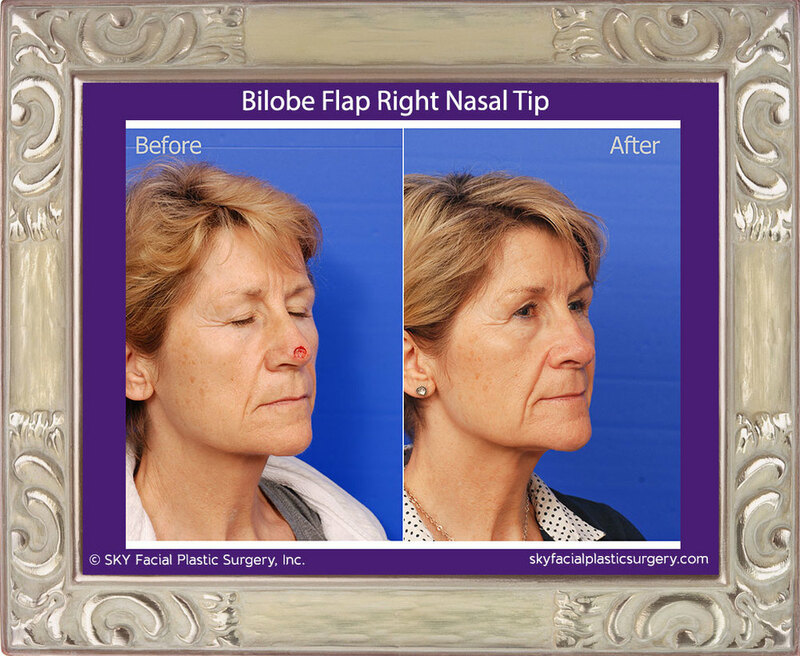 This lady had failed a previous attempt to reconstruct the left nasal ala with a melolabial flap by another surgeon. She asked Dr. Yoo to help with the cookie bite deformity. A composite graft from the left ear was used to restore the natural contour of the nose. 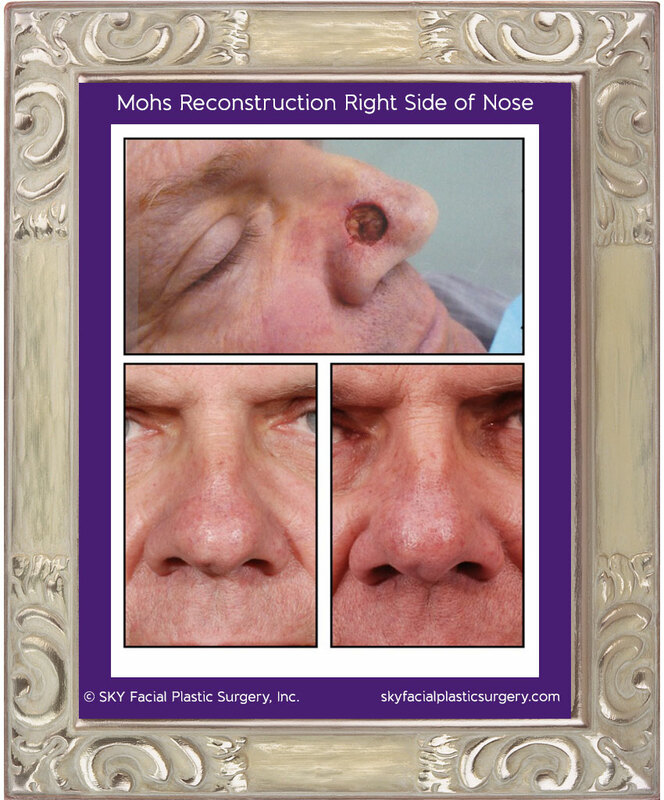 Mohs defect of the upper lip was repaired with a combination of advancement flaps and skin grafting of the philtrum. Large right forehead defect from squamous cell carcinoma. After Mohs surgery, this was repaired with a modified O to T closure. Basal cell carcinoma of the left ear. The before photo shows the cancer which was later excised and then reconstructed. The after photo is from 6 weeks subsequent to surgical reconstruction. Bottom left photo shows cancer before surgery. The top picture shows the patient after the cancer has been removed with clear margins (defect is quite a bit larger than would be suggested by its initial appearance). Bottom left photo shows the area after reconstruction and healing. Advancement of a mucosal flap was used to repair this left lower lip squamous cell carcinoma defect. Lower left photo shows the defect after Mohs surgery to remove the cancer. Top photo shows immediately after reconstruction. Bottom right photo shows the healed lower lip 3 months after reconstruction. 83 year old gentleman with skin cancer on the right nasal tip. This was removed by a dermatologic surgeon using Mohs surgery techniques. Dr. Yoo reconstructed the defect shown in the top photos with a modified Zitelli bilobe flap. Results are shown 6 months after surgery. 59 year old gentleman with basal cell carcinoma of the right nasal dorsum. 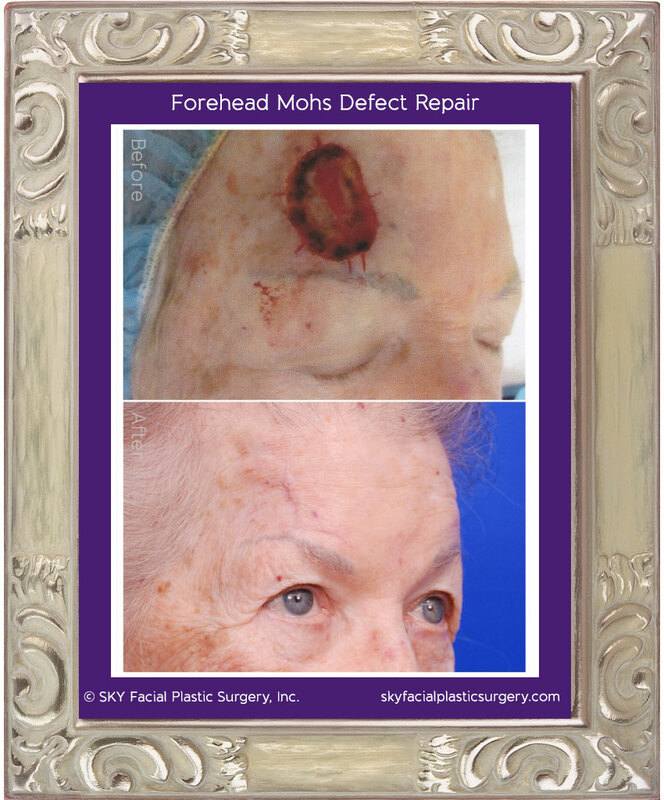 This was removed by a Mohs surgeon and the resulting defect is shown in the top picture. One year after reconstruction, the nose shows little evidence of the surgery. 64 year-old woman with squamous cell carcinoma of the right cheek. The cancer prior to excision is shown in the "Before" photo. The actual defect was quite a bit larger after tumor removal. The right photo shows the repair 1 year later. 70 year-old gentleman with basal cell carcinoma of the left nasal sidewall and ala. Reconstruction was performed with a bilobe (modified Zitelli) flap. Results are shown 5 months after the operation. 69 year-old woman with squamous cell carcinoma of the lower lip. 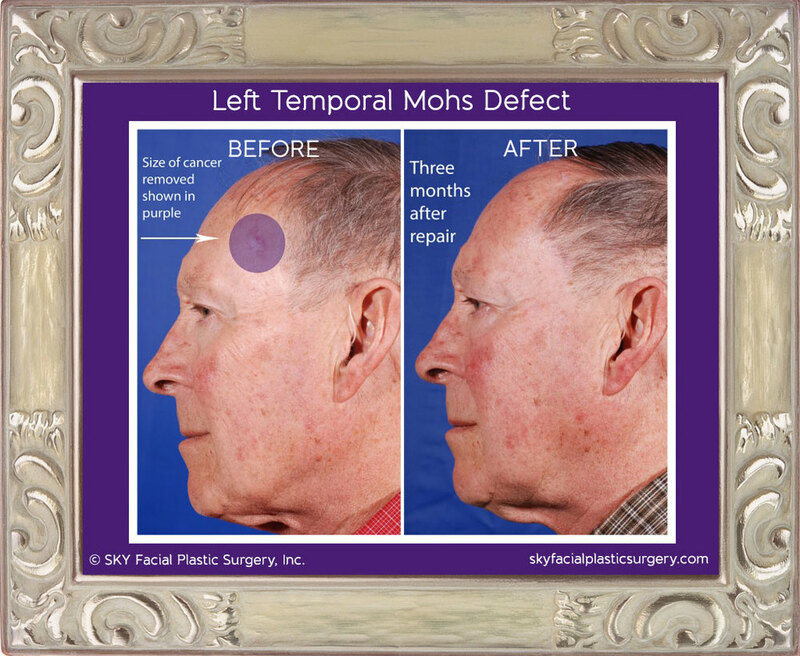 A dermatologic surgeon performed Mohs surgery to remove the tumor. The defect is shown in the top photo. A mucosal advancement flap was used to reconstruct the defect. Results are shown 1 year later. 71 year-old woman with basal cell carcinoma of the nose cheek junction. A dermatologic surgeon performed Mohs surgery to remove the tumor. The defect is shown in the top photo. An island pedicle flap was used to reconstruct the defect. Results are shown 1 year later. Bilobe flap to repair defect from Mohs surgery to remove basal cell cancer of the right nasal sidewall. Results are shown 8 months after surgery. Superficial skin cancer of the left nasal ala was removed by a dermatologist. Dr. Yoo placed a small skin graft to repair the defect. Results are shown 10 months after repair. This patient had basal cell carcinoma of her left ear scaphoid fossa. A small skin graft was taken from in front of her ear to match the texture and color for reconstruction. Results are shown 4 months after surgery. This woman had basal cell carcinoma in two spots along the left cheek. She had a dermatologic surgeon remove the cancer. The resulting defect is shown as the "before" picture. Dr. Yoo performed a rhomboid flap reconstruction of the defect. Results are shown one year after surgery. Bilobe flap to reconstruction right nasal tip defect from skn cancer.